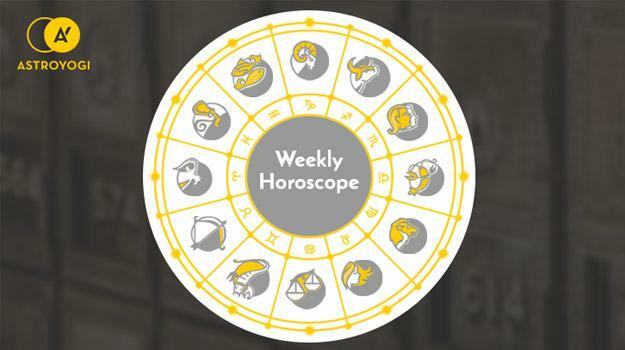 Your weekly horoscope (4th to 10th Feb 2019) analysis can provide insights on the crucial planetary movements and its impact on your life. Stay tuned to Astroyogi’s expert astrologers for horoscope analysis. Your professional goals and aspirations materialise well this week. If you have career-oriented desires, you’ll find that things effortlessly fall into place. Positions where you are called upon to be a leader appeal, but you must rule fairly and justly. You are at ease around powerful or influential people, which garners you their respect. They assume you are one of them. Your level of enthusiasm is infectious and ensures that even the most tiresome work project is completed with aplomb. On the 7th, as Mercury moves into Aquarius, monetary gain is assured. Your energy is hyperactive, almost manic, as you long to be involved in all things. You are driven to participate, to be part of the hum of life, and you enjoy every minute. There is a kind of happiness that permeates right to the bone. It is a body and soul happiness that restores and nourishes. This week, you are in possession of this rare and elusive brand of joy. People may ask you what your secret is, but truthfully you do not know. Perhaps it is being caught in an upward spiral, constantly adding positive new energy to your life so that it can only lift you higher. At work, you bring a degree of determination and willpower that few can match. If something needs to be done, you will be called upon to action it successfully. On the 6th, Mars moves into galvanizing Aries. If you can communicate your needs, they will be met. Mental tension can manifest in many ways. In our daily life, it can materialise as rumination – the constant churning over of if’s, but’s and maybe’s. In sleep, it can emerge as dreams and nightmares, hostile and vivid in nature. What is your mind trying to tell you? Is there some grand lesson that is trying to reach you, either on a conscious or subconscious plane, and are you heading it’s call? Venus in Sagittarius brings a boundless sense of adventure in life. A partner may encourage your inner explorer to break free. You will learn much from this person, and they from you. Mars in Aries suggests an innate sense of positivity. It is easy for you to believe that good things will happen. Misunderstandings are the worst kind of distance between partners. When we misunderstand, we assume or infer what another means, thinks or feels, which causes us to feel defensive and to withdraw. It is important that you are honest and direct with the loved ones in your life, so as not to push them away, or be pushed away in return. Open, authentic communication is vital to the success of our relationships, and we must learn to communicate appropriately if we want our relationships to survive. With Mercury in Aquarius, you are at your best professionally, possessing a spark and dazzle that is highly captivating. Mars in Aries brings support even if clouds gather on the horizon. Leo, you are born and bred to feel and be victorious. This week is no exception. Your desire to be victorious pushes you to conquer a particular mountain of significance to you. There is a desire for change and growth that must be heeded. Be cautious with regards to your health. You may be ignoring the signs of your body, or alternatively, you may be pushing yourself to an extreme mentally or emotionally that you are not comfortable with. Take time to relax, truly relax, the kind that feels intentional. Mars moves into Aries on the 6th, suggesting fame, luck and success in all that you do. This is a good time to push a project through to completion. The stars will assist you. You may not think of yourself as charismatic, but you are, often in a low-key, understated way that takes people by surprise. ‘Slow to warm up’ might be a good description for you. You like to assess a situation before you act. You aren’t one to blindly leap without looking, and this is often to your credit. You are sensible. That said, you shouldn’t underestimate just how magnetic and compelling you can be. These qualities can be used emphatically to draw people to you, the right kind of people for the right kind of reasons. With Mars moving into Aries on the 6th, you receive a career boost. There is a desire to expand particularly in work, which is likely to manifest. For Libra, life is all about love. There is little else to get out of bed for in the morning! Love feeds your soul and makes you sing – it fulfils you on a deep and significant level. Any way that you can add more love to your life, you should. This should be your intention for the year ahead. You may feel scattered and unfocused, generally unsure on which mast to stick your flag to. The Libra trait of indecision can be an uncomfortable one – especially when you struggle to find the answers within yourself. Try not to think your way out of everything all the time, sometimes only feelings and instinct can solve the perils of the mind. With Mars in Aries, you are drawn to spiritual endeavours. This will help to calm you. Social and spirited, you are involved in anything and everything you can get your hands on this week. This excess energy makes you a firm friend. People want you around and you want to be around people. Your inner extrovert has emerged and is here to stay! Some may be surprised by the change in you, but most will be impressed. They knew there was a social soul lurking beneath your spiritual depths. With Venus in Sagittarius, your mind is voyaging and pioneering. You come up with brilliant ideas that have financial feet and the tenacity to see them through. Mars in Aries can trigger some fussing and feuding, but ultimately this week will be a triumph. This is a week of decisiveness, of clear and focused decision making. It’s easy for you, easier than normal, to make a decision that benefits, that feels innately right. There is no back and forth over whether the decision made was the correct one. You simply trust yourself, trust the process and trust life. With Mercury in Aquarius, there is a sense of worry and anxiety. This should be shared with someone you trust so that you are able to clear your mind. Do not hold things inside. Mars moves into Aries on the 6th, indicating marriage or the possibility of marriage. Your career brings new challenges that you will be able to brave in an admirable fashion. at work, there is a sense of competition, but you cope well. With the sun in Capricorn, you may be thinking about time. Such an elusive concept, and one that stumps us all. Are you using your time effectively? Where do you want to be this time next year? What do you see as a good use of time? How do you waste time? Asking and answering these questions may be beneficial for you. Relatives encourage and assist you in your aspirations whenever they can, especially if you are pursuing a course of action in terms of your education. With Mars in Aries, your love life is full of vim and vigour. You are an active participant, understanding that love is a doing word and must be shown through actions. Your confidence may not be as high as it usually is. This is something to reflect upon. We all have experiences that knock our sense of self. What is important is that we can bounce back again. Avoid making any big decisions and simply process your thoughts and feeling. Like passing through choppy waters, some things must be passed through in order to fade. There is no way over or under – simply through. There is a sense of restlessness to you, a need for something new. Think through your options but don’t act quite yet. With Mars moving into Aries on the 6th, fame and recognition are guaranteed. You feel in a romantic mood, longing to share your sprightliness with others. Life is good to you this week Pisces. You will see success and growth in all areas. Things manifest around you, and flourish and the bounty is there for you to enjoy. Anyone who would plot against you will fail. The important thing to remember, is that planning will help you get to where you want to be. Using your time proactively and efficiently is the best way to hit your target. Do not think as you can tend to, that things will always fall on your lap. Do not leave things entirely to chance. On the 6th, Mars moves into Aries, and things begin to happen around you at a fervent pace. You watch this all unravel, deeply pleased. Life is happening, and you are enjoying its gifts.